This year's New York Auto Show gave the Japanese automaker Subaru a chance to showcase their latest take on the Subaru Legacy. 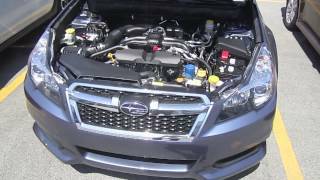 Unfortunately the public reaction is mixed, as the 2013 Subaru Legacy comes with a few tweaks, but also brings with it some bad news. 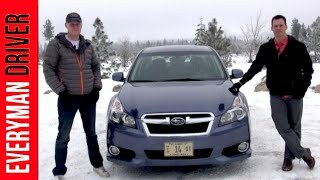 The bad news is that unfortunately the turbo model has been dropped by Subaru, which was somewhat of a disappointment for all the Subaru Legacy enthusiasts. 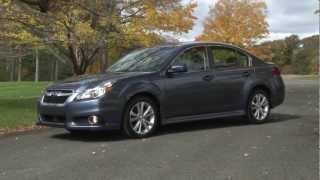 Nevertheless, the 2013 Legacy comes with some updates so let's take a look at what we can expect from the latest model. Now that the six-speed 2.5 GT variant has been put aside, the Legacy 2013 will come with only two engine variants. The first one comes in the form of a new 2.5 liter four-cylinder engine which now features a dual overhead cam design. Performance-wise the 2.5 liter engine is able to produce 173 horsepower and 174 lb-ft of torque which is not a big improvement compared with the previous 2.5i engine which produced 170 horsepower and 170 lb-ft of torque. However, Subaru claims that although torque remains almost the same, it's now produces across a wider rev-range. The fuel economy has also improved by one mile to the gallon and the new Legacy will now cover 24 mpg city and 32 mpg highway, compared to 23/31 mpg offered by the previous 2.5 liter model. The 2.5 liter engine is paired with a six-speed manual gearbox as standard, but the 2.5i Premium and Limited trims offer a revised continuously variable transmission (CVT). The second engine variant comes as a 3.6 liter flat six engine able to produce 256 horsepower and 247 lb-ft of torque. The 3.6 liter variant is mated with a five-speed automatic gearbox. 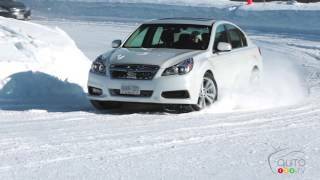 As expected all-wheel drive will come as a standard for the Subaru Legacy 2013. The exterior of the upcoming Legacy has been improved and at first glance, draws from the Impreza, especially at the front end. Notable changes are to be seen in the headlamps and taillamps, front grille, front and rear bumpers, and to sweeten the deal a redesigned set of wheels have been fitted. The interior of the Subaru Legacy 2013 has undergone changes as well and it now offers rear-seat AC outlets on the Limited models, new seat fabrics and a 3.5 inch color display mounted in the middle of the instrument cluster. Furthermore the new EyeSight safety feature will be also available on some of the Subaru Legacy 2013 trims. While the 2.5 liter Legacy will offer a choice of three trims, the 3.5 liter version is limited to two. Other features that are to be found on certain trim levels are leather-wrapped steering wheel, heated seats and mirrors, leather covered seats, automatic climate control, Harman or Kardon audio systems, a 4.3 inch navigation system and a power moonroof.